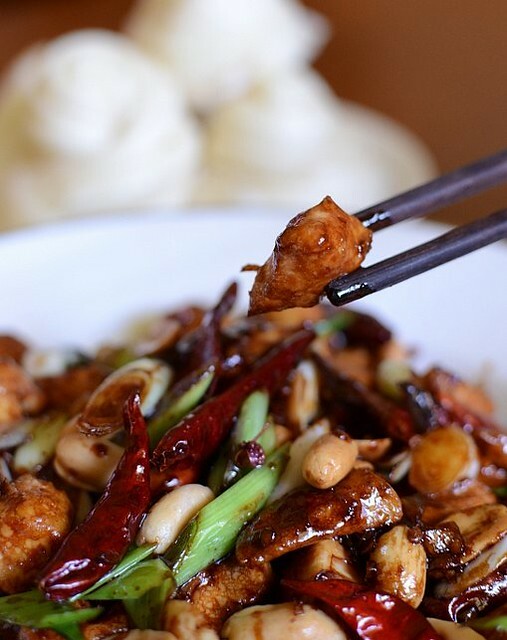 The spicy Sichuan dish gong bao ji ding (Gong Bao's--whoever he was--chicken bits) is equivalent to the Cantonese gu lao rou (sweet and sour pork) in terms of popularity. Chinese restaurants in the USA in particular will without fail have gong bao ji ding, gu lao rou and beef with black soy beans on their menus. I used to cook this dish until I taught my MIL who then cooked it so well that I gave up cooking it. Through the years however, MIL's gong bao ji ding has evolved according to my FIL's taste and she now makes the dish a mild version with lots of soy sauce, Shanghai-style, so recently I started cooking my version again and since she doesn't read my blog, I'll declare that my version is not only better than hers but also better than all the restaurants in this town because their gong bao ji ding are a black sticky mess of burnt chilies and a few chunks of chicken. I dare say that this recipe is so fool proof that there's no need for tweaking. You just need to know how to fry the ingredients to get them at their best flavor and texture. 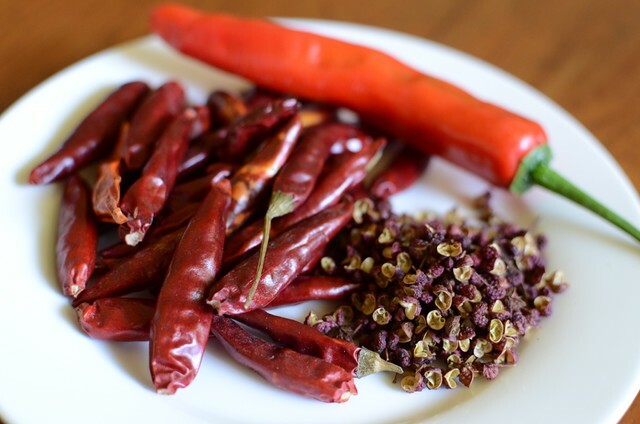 Sichuan dried chilies are smaller than our red chilies and much hotter too. Next to the chilies are Sichuan peppercorns, best if straight from Sichuan because they loose their fiery numbness with time and bad storage. The peppercorns should be kept in a glass bottle in the fridge. What makes a gong bao ji ding better than just good? Firstly, it must not only taste good but look right too. By that I mean the dish must look dark, not pale, and the sauce must be thick, not watery yet not starchy. Secondly, chicken chunks should be small so that there's greater surface area for the sauce to coat and for that, the sauce must be caramelized enough to cling to the chicken. If the sauce is thickened mainly by cornstarch, it will not have that caramelized soy sauce flavor and thickness. I do add a very small amount of cornstarch to hasten the thickening but not so much that the sauce is starchy. Thirdly, the chilies--preferably Sichuan dried chilies because they are packed with heat and capsicum fragrance--must be done just right: crispy yet not burnt. I'm not particular about the Sichuan peppercorns; this dish is good even without those numbing explosives. Fourthly, the nuts. Some restaurants, especially the upscale ones, use cashew nuts instead of peanuts. I've tried using cashew nuts but found that the dish is far better with peanuts. This is a dish that you pick at with chopsticks, savoring the sauce-covered chicken or leeks or nuts and perhaps washing them down with a cold beer. Cashew nuts just fill the stomach up too quickly compared to peanuts. Finally, the chicken. Even when you get the sauce right, you fail if the chicken turns out tough or dry. To make sure that doesn't happen, marinade the chicken in egg white and cornflour a few hours ahead of cooking and do not overcook. I like to use chicken breasts for this dish because they are very tender when cooked right. Also, keep to the exact amount of chicken and other ingredients. If you want two portions, fry each portion separately. I've tried the easy way out once or twice, using more chicken and other ingredients instead of frying in two batches and while it's okay, it's not superb. Follow the recipe and you'll get a super superb gong bao ji. Gong bao ji ding is best piping hot and I like to cook it when my guests are seated at the table. It's a simple dish but you may need to practice cooking it before it's perfect. 1. Cut the chicken breast into small chunks, about 1.5 to 2 cm square. Massage marinade into the chicken with your hands, cover and leave in fridge for at least 1 hour. 2. Heat 1 cup veg oil in a wok, add the chicken and spread it out into a single layer. When chicken has turned white at the sides (high heat), turn over and stir. Do not overcook. I check by cutting one piece of chicken with the frying ladle. It should take about 1 minute only, less if the fire's very hot. Remove chicken onto a plate, leaving the oil in the wok. 3. Pour away the oil into a metal or ceramic bowl until about 3 T is left in the wok. 4. Fry the chilies, in very low heat, until crisp but not burnt (be careful, dried chilies burn quickly). Remove. Pour away all the oil because it is chili-hot. You can keep the chili oil for other dishes. 5. Add 1 T of the oil used for frying the chicken to the same wok (this IS a greasy dish; be brave) and throw in the leeks, stir until they turn bright green. You can remove the leeks onto the chicken or push them aside in the wok and proceed to the next step. Add the garlic, ginger and Sichuan peppercorns (if using) to the wok, stir a couple of seconds. Pour the sauce into the wok, stirring all the time at high heat. 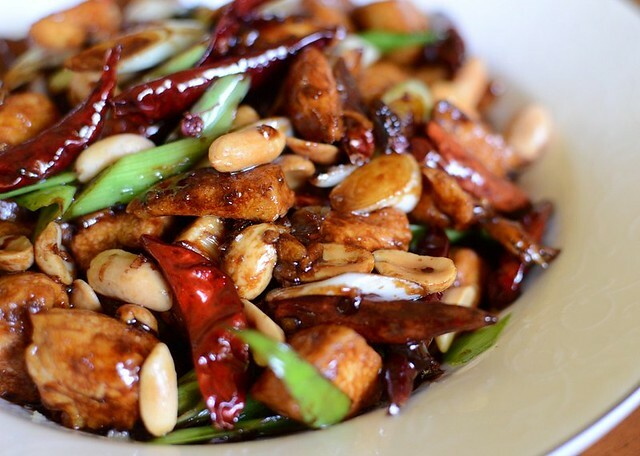 When the sauce is very dark and thick, add the chicken, chilies and leeks, stir quickly, then add the peanuts and dish up. That's it. Serve straightaway. I've always liked this dish due to the trueness of it's CFT (Color - Fragrance -Taste) principal. I could wallop a whole pot of rice on this dish alone, that good. I am definitely looking forward to making this dish sometime this week based on your recipe (minus Szechuan peppercorn). Thanks for sharing! This is bad... everytime I come to your blog, I am enticed with so many yummy food. You are very wicked! Hehehehe.. Yes, shall try this tomorrow.. I love this dish with rice.. yummms!! When you say cornflour, are you referring to cornstarch? or flour ground from dried corn? Thanks! Looks yummy, can't wait to try the recipe! Your recipe is similar, but I like the addition of the leeks. And your pictures are stunning. food: yes i am. i'm even more wicked to myself bc since starting this blog, i;ve put on 4 kg! sue: the other thing about this dish is tt you shd not add the sauce to the fried ingredients bc if you do tt, it will thicken like the usual chinese-cantonese dishes but rather, the sauce shd be thickened more by the caramelization of sugar; the taste and scent is different. so cook the sauce over high heat, stirring quickly and then add the fried ingredients. I'm definitely making your version next time. I love your explanation of the difference between the recipes. i just downloaded the image and ate it! yes, Americans do eat a lot of this, but i think it is rarely this good or refined outside of places like NYC, LA, SF or Seattle. you mention black bean sauce, do you have a recipe for that too? i have searched our blog and not found one. lunchguy: lol! i have a recipe for steamed spare ribs with black beans but i know which dish you are talking about--stir-fried beef with black beans and peppers right? actually my favorite black bean dish is a cantonese one, clams in black bean sauce. there is a place in NYC, on mott Street that does it well and also at the poor man's market on the quay on hong kong Island. the clams they use are what we new yorkers call Cherry Stone Clams. the other great black bean dish for me is jumbo shrimp in black bean sauce, again cantonese cuisine. i find i prefer seafood with black beans over meats and poultry, especially the clams which impart some great flavors into the sauce when they open and their juices mingle with the sauce ingredients. i do not know if the names translate, but this is what all of these items are called in NYC China town. i could not resist adding a bit more about wo hop. the bottom line is this, you either love this place or hate it, and for all the same reasons. people will stand in line for hours to eat here during the rush hours. i suggest going in the afternoon when the lunch hour is over, or late at night just before the drunks arrive who know that it is open 24 hours, once they arrive the wait staff go into miserable mood, and rightfully so. drunk, rude new yorkers are not such nice people to serve. it is authentic NYC chinese food, not authentic chinese food. there is a very distinct difference. Wo Hop is down a flight of stairs at 17 Mott Street, and has been since 1938.
the egg foo young, although a typically mundane dish anywhere else, is simply fantastic here. ... Raised by Chinese parents, I've had my fair share of authentic Chinese food, yet being a byproduct of American culture, my palate has developed a particular liking for the super salty, super savory takeout Chinese food we're all so familiar with. While many wo hop lovers take offense to associating this place with a run-of-the mill neighborhood joint, I will say this is the cream of the crop of greasy Chinese food! lunchguy: whoa! everything you mentioned made me drool! you aren't lunch guy, you are lunch and dinner guy! sub gum btw, is a word i learnt in canada. upto then, i've never heard of the word and even now, back home n in china. i think it's north american term for mixed veg n meat? my understanding of the term sub gum is that it refers to any mixture, similar to the Thai term ruam mit. the western favorite mixed grill would be sub gum or ruam mit. in regard to CNN's list of 50, how could yo nail it down to 50. and i also think it would have a lot to do with the mood of the day. chinese roasted meat, those hanging in windows, roasted ducks, crispy pork, cha siew as you list them would also be for sure. i do agree with thai papaya salad as making it onto the list, and i would suggest well as thai hoy tod. lunchguy: really, papaya salad as one of the world's top food? i'll be...neways, hoi tod (thai is a funny language, comical yet charming)is very similar to oh chien, a chinese-hokkien dish here but oysters are used instead of mussels.i think i prefer oysters but i like the thai version frm what i see bc it's crispy. yum! but what a lot of grease! papaya salad is fresh, very good for you, a great value, and tastes awesome. it would be on my list for sure. hoy tod is traditionally either mussels or oysters or as i like it both. the new generation now bastardizes it with crab sticks. the best aspect of it is that the batter is ubber crispy, the oysters and mussels are plump and soft, and the bean sprouts they garnish it with are crunchy and refreshing. a good hoy tod chef cooks the dish in a lot of oil, but is bale to keep the dish relatively grease free. its all in the technique and their desire to make a perfect one. Just wondering when to add the chilies back into the dish, cannot see it in the recipe. I assume it is when adding the chicken or peanuts? anon: oh gosh. thanx for asking or i wouldn't know the error. add the chilies with the chicken at the end! so when you add the 1 1/2 T chicken stock . if you have 1 1/2 T water how much chieck stock powder should you add? why do you use caster sugar? What is the advantage? philip: 1'd say 1/3 teaspoon of chicken stock to 1 1/2 tablespoon of water is plenty--you dont want the chicken stock to overpower the flavor of the dish. caster sugar is very fine, and dissolve easily plus there's always some in the kitchen, so yeah. and i agree with you, shamelessly so, that this is the best best best gong bao ji recipe i've ever come across too. it's a recipe gotten through years and dozens of trials and errors!